For the passion fruit syrup: Combine the passion fruit juice, sugar and water in a small pot. Bring to a boil over medium heat and let cook for 10 minutes, or until it reduces and thickens slightly. Remove and let cool. This syrup can be refrigerated in a well-sealed jar for weeks. 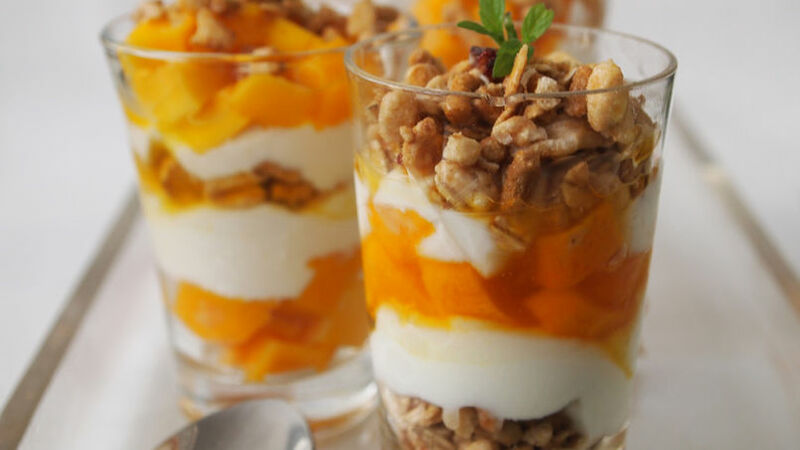 For the parfait: In cups or glasses, alternate a spoonful of mango and a spoonful of yogurt. Top with a teaspoon of the passion fruit syrup along with the Fiber One™ Protein cereal. Repeat until you fill the cup. If you started with mango, try to finish with cereal. If you started with cereal, try to finish with mango. Decorate with mint leaves and serve immediately, with more syrup on the side. You can use banana, melon, papaya, strawberries or raspberries instead of mango. Use vanilla yogurt or any flavor you like. Add shredded coconut to the cereal to give it a tropical touch. With just a few ingredients you can prepare a refreshing breakfast or a delicate dessert, like this parfait, which does justice to both. As the temperature rises this recipe often becomes my go-to breakfast because it has everything I like to eat, and the combination of flavors and textures is wonderful. And since it's so light, I don't feel guilty for indulging. The contrast of the parfait with the Fiber One™ Protein cereal is spectacular, and makes for a delicious and refreshing treat. But remember, once it's ready it must be enjoyed immediately. Otherwise the cereal loses its delicious crunchy texture.